These little beauties are packed full of fibre for a healthy digestive system and bursting with flavour. The good thing is, you can create any combination of ingredients that you like, you’re not limited to what we have here. Cut up into squares for healthy lunchbox treats or work snacks, or create shapes by baking in silicon moulds. The great thing is, this recipe can also serve as the base for our delicious Fudgy Truffles. So, make double the quantity you see here and use it to make some more healthy treats while you’re at it. Or, simply combine all the dry ingredients and voila! You have a delightful cereal! 1/4 cup cranberries (preferably unsweetened), sultana’s or any other dried fruit. Pour the syrup over the dry ingredients and mix with your hands to combine thoroughly. Pour into heart shaped silicon icecube moulds, or a 25 x 15cm cake pan lined with baking paper. Bake in a low oven, 100 degrees for 35 minutes. Turn oven off, and leave to cool IN the oven for 1 hour. Remove from the oven and leave to cool before removing from the moulds/tray and slicing into squares. The chia seeds contain high amounts of protein and omega 3 oils which are essential for keeping skin healthy, reducing inflammation and protecting our heart from heart disease.The chia seeds also contain high amounts of protein and omega 3 oils which are essential for keeping skin healthy, reducing inflammation and protecting our heart from heart disease. 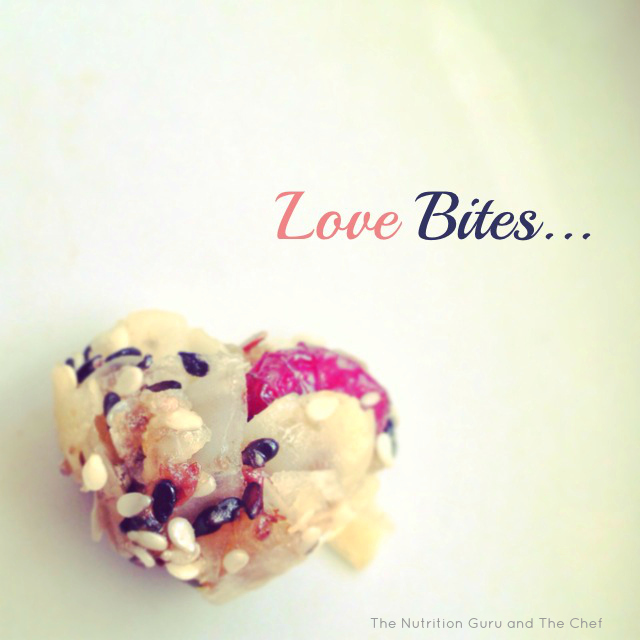 Seeds and nuts are rich in heart healthy polyunsaturated fats and phytosterols which protect us against heart disease. High in fibre, they also protect against bowel cancer as they keep moving the food through our intestine at a regular rate. The fibre in nuts and seeds also has the ability to lower cholesterol, particularly almonds. 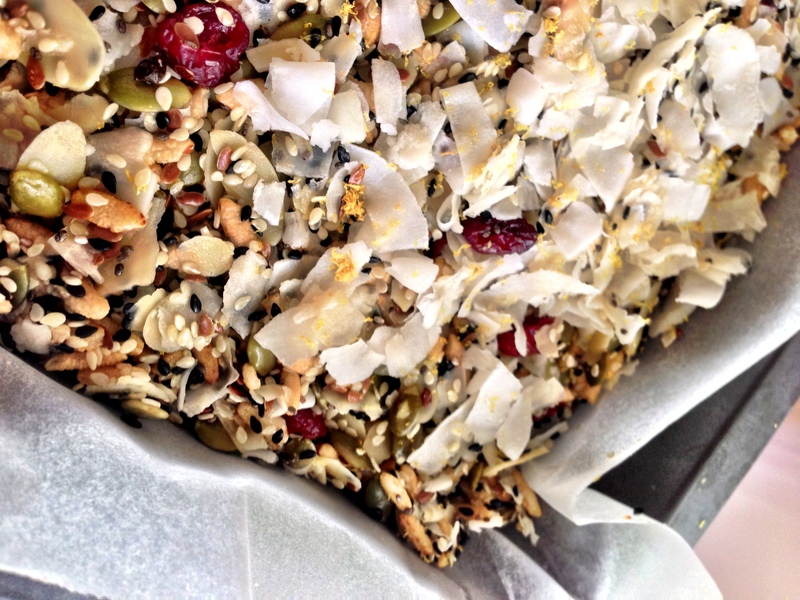 Coconut adds a delicious texture and flavour and is super high in fibre. As is the puffed rice, a great gluten free carbohydrate alternative for energy. Both the sesame and sunflower seeds are a rich source of tryptophan, my favourite essential amino acid. Once eaten, this little marvel gets converted into the ‘feel good hormone’ serotonin which helps to regulate our mood and sleep. Goji berries are high in Vitamin A, the antioxidant essential for maintaining healthy eyesight. They are available in most supermarkets and you will find them much cheaper at your local Asian supermarket. The GI of rice malt syrup is unknown, contrary to what you may read on some health sites. It’s still a sugar so I have used sparingly, but this syrup has a consistency that brings the whole ingredients together well and has a lovely flavour.